Instead, any person in the room can turn a computer or phone into the remote control for the Daily.co TV. In general, the screen code is ALL CAP 6-letter code. It's in the lower right of a Daily.co TV screen — assuming it's plugged in and online. If your TV isn't in a meeting or wireless presentation, you'll see something like the below. Instead of the bridge, you might see your company logo. When you put the TV screen code into your computer or phone, you've "paired" your device with the TV. You now control the TV. On your computer, you'll see our controller page. 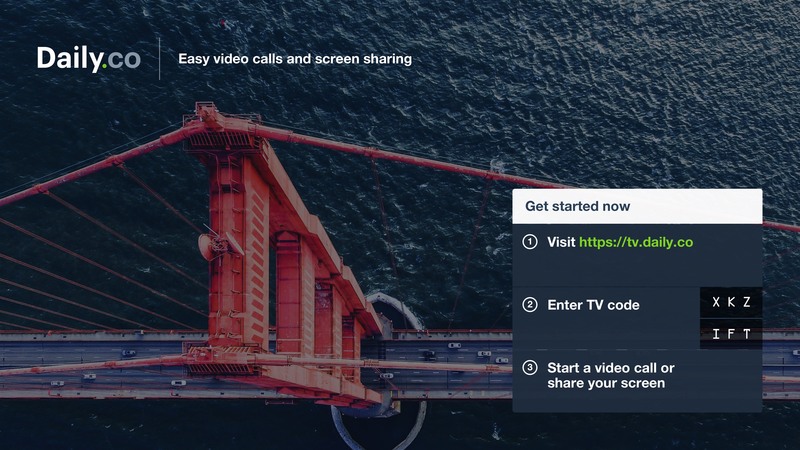 It lets you start a call or screen share. Or, as in the second image, control a call you're in. The purpose of the screen code is security. It's like a lock on your physical TV screen. Only people in your room, who can see the TV screen, can know the code. This means you control what's put on your screen. The screen code changes any time the HDMI is reset. For example, whenever you reboot your system, the screen code changes. Always-on customers can customize their portals, so the TV does not show a screen code. This means teammates can't take the TV out of the portal! Contact us for more info. I already have a meeting link. How do I join a meeting from my Daily.co TV? 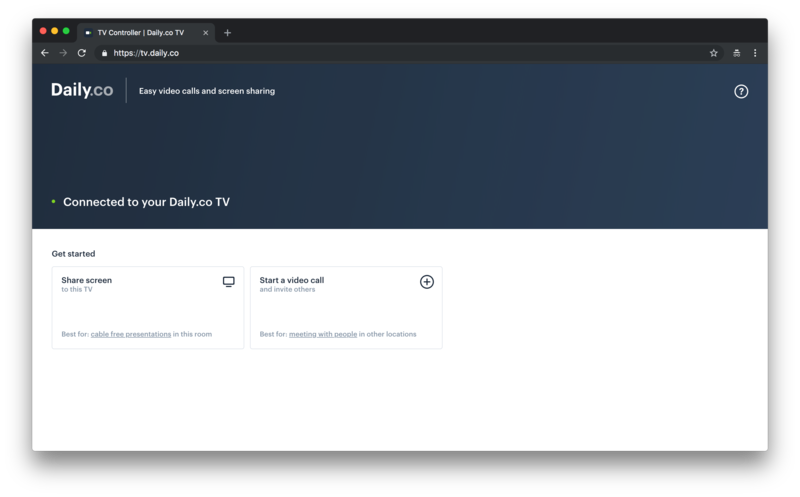 How do I wirelessly screen share to my Daily.co TV?